Wow, already July! Here we go with a few things to plant this month in our area, not too many, but everything else is growing well! Brussels sprouts Grow in seed trays, plant out in 4-6 weeks. Harvest from December. There ya go, planting for Fall! Yay! As always, great to hear from you Grandma! I figured I'd better get this out for all of us before we got too much further into July! We have a few new people in our Apollo Garden and they were asking just yesterday about what could be planted "this late in the season" ... and I promised to post some things. Now if I could just keep up with the Tomato Tuesday pics!! I was wondering what to plant for fall. Thanks for this post. Quick question - how much sun for the Brussels Sprouts - I have a part shade spot that I was thinking of. I'm brand new to this site and still trying to navigate my way around. I have my garden in half wine barrels on my back deck. They get lots of sun and it can get quite warm back there. Was wondering what I can plant now. Any mid summer lettuce? When I post information about what to plant in Northern CA, etc, I've been basing my information on what I receive from a site called Gardenate. I receive monthly updates and pass on the information here. Recently they sent a message that they had updated their information regarding climate zones to match those of the USDA hardiness zones. Soooo, what this means is that my generalized information about what to plant here in Northern CA isn't as precise as it could be! I'll try to cover a few areas in future posts, but it you'd like to find your own local hardiness zone click here, enter your zip code, and check out the map to find your precise zone. The good thing is that for most of us here in CA, we can plant just about anything, and in almost any location. hcolette, you asked about mid summer lettuce in your Santa Cruz area. According to the folks at Gardenate, yep, in August you can plant lettuce and harvest in November. Your temps won't reach the triple digit highs we have here in the Central Valley so you shouldn't have any problems, but I'd watch them closely if the temps start going up. Here in our area we can shade the little guys and keep them watered...seems to work OK. I'd suggest you check with a local nursery, or the garden dept in any of the larger home improvement stores. Often there's someone who has great knowledge just waiting to share! @PNG_Grandma wrote: Wow, already July! Here we go with a few things to plant this month in our area, not too many, but everything else is growing well! Brussels sprouts - Grow in seed trays, plant out in 4-6 weeks. Harvest from December. Pak Choy - Sow in garden. Harvest from October. Sunflower - Sow in garden. Harvest from November. ]Zucchini / Summer squash - Grow in seed trays, and plant out in 4-6 weeks. Beans - Plant in garden. Broccoli - Plant in garden. Chinese cabbage - Start undercover in seed trays and plant out in 4-6 weeks. Chives - Start undercover in seed trays and plant out in 4-6 weeks. Sweet corn - Plant in garden. Tomato - Plant in garden. With this heat, I'm personally focused on keeping everything watered, shaded and alive! I can't imagine starting anything for fall. Gardenate suggests cow peas and collards for Zone 9A. ?? I wonder if they revised their planting schedule because this is different from prior posts. ?? I recommend everyone staying cool (except for 4th of July festivities ) It's hard to garden around triple digits. @sanderson wrote: Gardenate suggests cow peas and collards for Zone 9A. ?? I wonder if they revised their planting schedule because this is different from prior posts. ?? I recommend everyone staying cool (except for 4th of July festivities ) It's hard to garden around triple digits. It's actually a pleasant 89 here right now, down from a high of 94 -- just about perfect for this area. I planted NZ spinach today (seeds from a very nice person here on the forum -- ). Those seeds look like they came from another planet. I can't wait to see what the plants look like. Now, just patience. Don't let them dry out. @sanderson wrote: Now, just patience. Don't let them dry out. I promise to take good care of your babies, Sanderson. Ditto on your babies, come fall. @sanderson wrote: Ditto on your babies, come fall. Maybe we should synchronize our planting schedule for those summer broccoli seeds and compare notes. Sanderson -- 2 of your NZ spinach seeds gave birth to triplets! If those seeds hadn't been so big, I'd blame it on sloppy planting, but there's no way I could have accidentally slipped 3 of those babies into the same hole. Should I just leave them alone? They must know what they're doing, right? I can't remember what it looked when it sprouted. The plant does spread in all directions. Maybe I will plant another. How many days to sprout? @sanderson wrote: I can't remember what it looked when it sprouted. The plant does spread in all directions. Maybe I will plant another. How many days to sprout? 3-5 days to sprout and I just found another shoot next to one that sprouted yesterday, so most of them have multiple births. This gives me an idea for the forum. How about a "sprouting gallery" where we can post images of our new-borns. 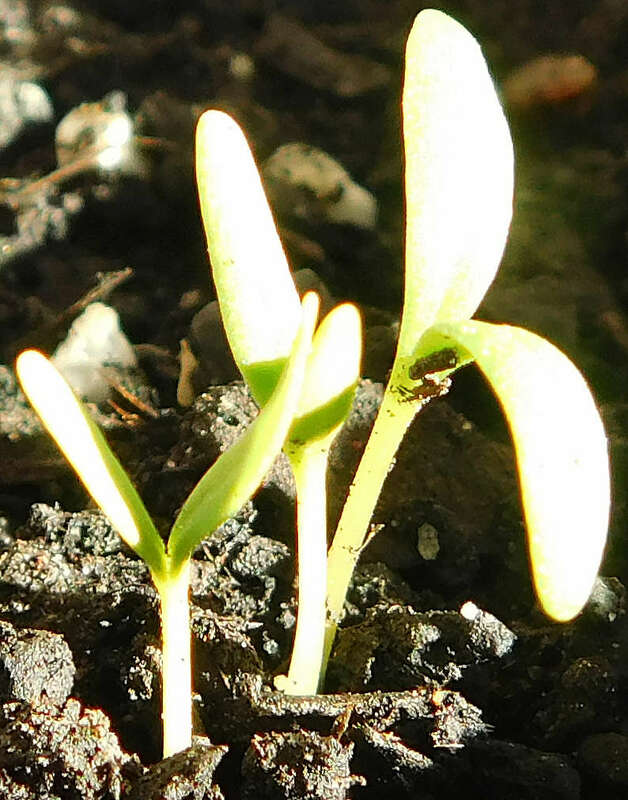 It could help us all identify volunteers (or keep us from nurturing weeds ). Interesting idea. If we plant per Mel's instruction, using grids and specific pacing, anything that comes up in another spot is either a weed or a volunteer. Let me think a bit. I transplanted my next round of tomatoes -- 4th of July, Snow White cherry, and crimson beefsteak. I hope they do better than all those mid-eastern goofy things that took 120 days and gave back almost nothing. I also planted some other tomato seeds that will probably end up in the house for the winter. Those were green grape, window box, and Little Boy. Sooner or later I'll have to hit on something that works, doncha think? I also started a squash that's supposed to taste like sweet potatoes -- bush delicata. Hopefully that will yield something special for Thanksgiving. To garden is to remain optimistic. @sanderson wrote: To garden is to remain optimistic. I guess that makes me Charlie Brown to Mother Nature's Lucy. I'm Charlie Brown when it comes to tomatoes . . .
Mmmm...delicata! I can't grow them here due to SVB (tried last year) but I may be able to cover a bush delicata. Where did you get it? Sanderson, I think once you find the exact right varieties for your area, and figure out the perfect timing, you'll do great with the tomatoes. It took me years And I still can't get the big guys right. It should be easy here in New England with only one growing season. Sustainable Seed Co., here in CA. I have more seeds than I can use, but they take 85-100 days. Ya want a few seeds anyway? I notice that I didn't even bump this thread for last July. For those of you in the LA and SF are and other coastal niches, you can start some fall seedlings. For the rest of the State where it is hot, just water, mulch and get the shade cloths up. Stay cool.